Are You Going To Let Your Pennsylvania Drunk Driving Arrest Ruin Your Life? Here's How to Get A Free Consultation Which Will Show You How You May Be Able To Save Your License And Freedom. Wouldn’t it be great if you could just walk in and talk to the Pennsylvania prosecutor about your Pennsylvania DUI case? Explaining to them that while you may have had a few drinks, you really weren’t driving while drunk, like the arresting officer said. You were friendly, cooperative and helpful to the officer, and you promise you won’t do it again. So the drunk driving charge against you should just be dropped so you can get on with your life after paying some reasonable fine. Besides, loosing your license would mean losing your job and who does that benefit? But I can promise you, that kind of result in your drunk driving case isn’t going to happen. At least not in that way. Because the Prosecution’s purpose is to take your license away for as long as they can for your Pennsylvania DUI arrest. In fact, if your DUI case goes the wrong way the penalties you face include losing your license . . . your insurance rates going up or even being canceled . . . and you could even go to jail. And if you are convicted the State can even charge you fines and costs it the thousands of dollars. Plus, it doesn't end there. A conviction for violating Pennsylvania’s DUI laws will haunt you for many years to come, creating a permanent criminal record and even hurting you when you apply for a job. I want to tell you, though, that with the right defense by a Pennsylvania DUI lawyer, the scenario I just described doesn’t have to happen. You're probably like most people arrested for a DUI here in Pennsylvania. You don't really know the right thing to do about it, and you don't know whether or not you can win if you contest your arrest. For both of these reasons, I'd like to buy you a free consultation to give you information about these things and to review your case. If you would like to meet with me, I will be happy to set up an appointment with you. That way you'll be able to learn all you need to know about your situation. This conference is free to you and there is no further obligation at all. In fact, until you agree, in writing, to hire me, you will never owe me any money. To arrange for your free consultation, you can call and leave a message 24 hours a day if I’m not available when you call. Someone from my office will get back to you as soon as possible. Most importantly, when we talk I'll show you how you'll gain from this consultation. And I’ll explain to you why your situation may not be hopeless. To begin with, I'd like you to know that there's a good chance I can help. Did you know that there are at least 20 possible challenges that can be made to the Pennsylvania DUI charges you are facing? I'll raise the applicable ones for you so your DUI defense is as strong as possible. My goal is to get you off, to keep your record clean, and to prevent you from losing your freedom and your license to drive. You see . . . my practice is based on the belief that you were arrested when you shouldn't have been. At the very least, I'll make sure that you're being treated fairly. that the District Attorney provide us with the name and address of anyone he plans to call as a witness in your DUI case, as well as copies of every written or recorded statements. This will allow us to prepare the kind of questions that can weaken the Commonwealth’s case against you..
that the DA provide us with any information or material he has which would show that you are not guilty of the DUI charges against you, or which may help you get a lighter sentence. on proof that the police had a legitimate reason to pull you over in the first place. If not, thier case will be significantly weakened. As you can see, what looks simple gets pretty complex. As your attorney I will look into all of these things for you so that you will have the best possible case. The District Attorney prosecutes these types of cases all day. He knows--and is willing to use against you--all of the fine legal points that are available to him. 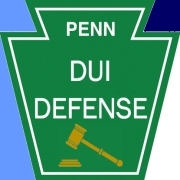 The Pennsylvania DUI law says that he only needs to prove that after drinking you were not able to drive your car safely or that your blood alcohol exceeds a certain limit. That sounds pretty cut and dried, but it's not quite as simple as that. You see, if challenged, the DA also has to show that the arresting officer made the arrest properly, that you were properly advised of your rights, that the equipment he used to test you was working accurately, and even that the person operating that equipment was certified to operate it. If he gets information which may prove you innocent, an attorney can make him give you that information also. I know how and where to make the proper motions which force the DA to prove that all the steps used in your arrest were done properly. If they weren't, then his case is weakened. I can't promise you that I'll be successful because each case is unique. Maybe the judge assigned to your case is more lenient on drunk driving cases, or maybe he is harsher on them. Maybe there are some things distinctive to your case which are important. However, I think you'll find that I am well-skilled, loyal and that I will fiercely protect your rights. However, I am very skilled at applying the law to your facts and when necessary, trying your case. Let me tell you how you'll benefit from your consultation. When we talk during your consultation, I will analyze the facts of your case, give you my opinion about it, and discuss my approach to your defense. I'll explain how we'll protect your legal rights, what your options are, and how the whole judicial process works, so you'll know exactly what happens. Plus, you'll learn how I will guide you through the court system and how I'll champion your rights, using all my ingenuity and the options in the legal system to defend and protect you. For example, I'll review the Complaint against you . . . the steps which were used to conduct the chemical and roadside tests against you to determine if they are valid . . . and I'll show you how the police officer's testimony can be discredited. Personalized attention. I'll return your phone calls promptly, keep you informed, and answer all questions to help you put the pieces back together. Reasonable fees, and you'll know in advance how you'll be charged. Experience. I am in the fifteenth year of practicing law throughout Pennsylvania in the State and Federal court and focused primarly on protecting my clients constitutional rights in DUI and other criminal cases. Aggressiveness. While I accept and encourage peaceful settlements, I take a tough stance to protect you. So, if you want an attorney you can talk to, who understands what you want, who is interested in you and your situation, and who fights to get you results, call me today at 1 800-529-9377 for your free consultation. Please remember, the charges against you are serious and can carry severe consequences which could be damaging to your present and your future. You can discover for yourself how I can help save your license and freedom by calling me at 1 800-529-9377.